In 1674, Dutch scientist Antonie van Leeuwenhoek discovered a world with more than a trillion trillion inhabitants that was previously unknown to humans; in that year he saw single-celled organisms he called animalcules and beasties. Although one of the most famous biological scientists, the founder of microbiology, he had only a modest formal education, wrote in only a single language—his native Dutch, and never wrote a book or a scientific paper. Starting in 1673, at the age of forty, and for the next fifty years until the day of his death, Leeuwenhoek corresponded with the Royal Society in London, writing hundreds of letters in informal Dutch describing his microscopic observations. These included protists (1674), bacteria (1676), as well as blood capillaries, muscle fibers, plant tissues, and sperm cells from a variety of species. These highly detailed observations were made possible because of his skill grinding lenses, achieving magnifications of up to 275 times the actual specimen size, with clear and bright images; by contrast, earlier microscopes could only attain twenty to thirty times magnification. Over his lifetime, Leeuwenhoek handmade 400–500 lenses and some twenty-five microscopes, always maintaining secrecy regarding his expert techniques. The use of lenses for the purposes of magnification dates back to the ancient Assyrians and Romans. The first compound microscope, in which more than one lens is used, was invented in about 1590, and these were essential tools used by Hooke and subsequent biologists into the twentieth century. Modern light microscopes can effectively magnify 1,000–2,000 times, while electron microscopes used in biology magnify up to two million times! SEE ALSO: Spermatozoa (1677), Cell Nucleus (1831), Cell Theory (1838), Electron Microscope (1931). 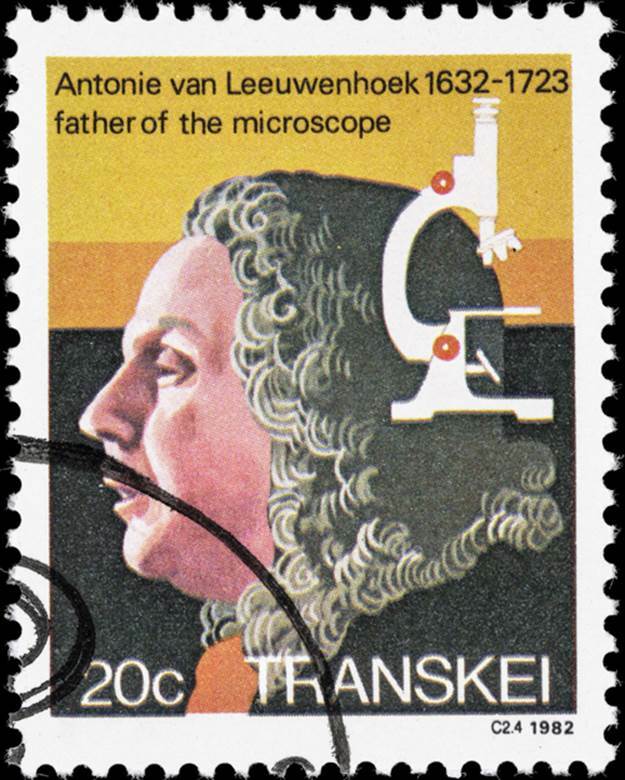 A 1982 postage stamp from Transkei, South Africa, bears an illustration of Antonie van Leeuwenhoek, the first scientist to observe and describe single-celled organisms.